This is the first year I've bought a season's pass for skiing (at Crystal Mountain), and I'm slowly seeing the pass devalue with each weekend without snowfall in the mountains. The Seattle P-I wrote about the grim outlook on an early ski season ("Slopes still awaiting snow"). 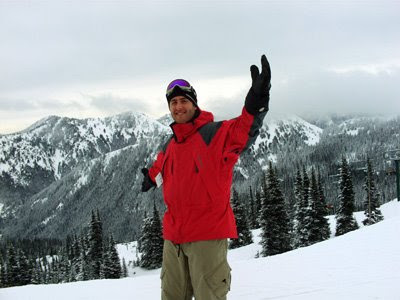 In the story, Seattle meteorologist Larry Schick, who specializes in forecasts for skiers (WHAT?! ), says area ski resorts typically need two or three modest or big storms to open -- that translates to a total of 36 to 60 inches of snow, which typically settles to 12 to 36 inches. Crystal Mountain has 0 inches of snow at its base right now. Grr. OK, so only a good ski season starts Thanksgiving weekend, but I was hoping to get at least once before I head out to Indiana for the holidays. Realistically, the soonest I'll be able to get up to Crystal Mountain probably isn't until New Years. Here's a picture of me all happy and skiing last year. Pray for snow!